Informix Twitter chat: Why NoSql and why Informix NoSql? What are the Industry #trends that are driving #NoSQL adoption? What challenges are companies currently embracing #NoSQL database models facing? How does #NoSQL help in providing enterprise-class capabilities and support? How can customers leverage new business patterns with hybrid #SQL /#NoSQL applications? How critical is lowering time-to-value and rapid application development with #NoSQL for customers? How important is leveraging skills to lower development costs and application development flexibility with #NoSQL? How you can leverage #relational and #non-relational data from a single application? How does the #NoSQL capability help in #analytics with existing #data and new data? Hoping that you will join us for this twitter chat and share your views! It was a great opportunity for us to meet in person with 100’s of Informix users in Malaysia and Thailand through the series of Discover Informix events we are conducting in the ASEAN region. 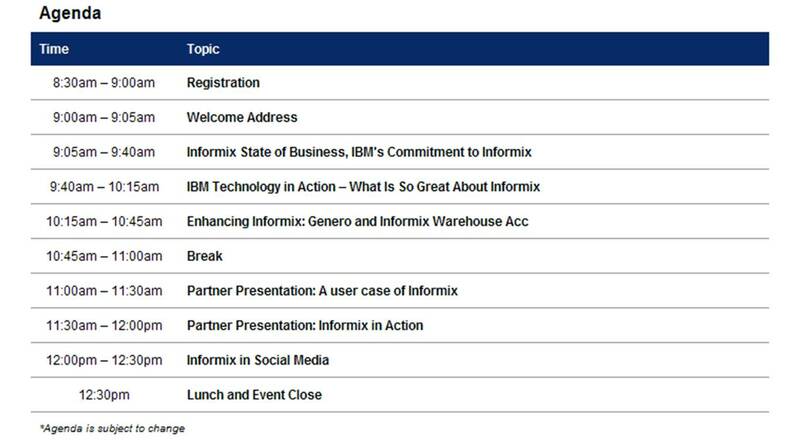 I would like to personally thank all Informix users who made it to the event – Thank you so much for your support and dedication. The results of these events have been very positive and motivating, and going forward we certainly look forward to meeting with you more often! After successfully conducting Discover Informix events in Malaysia and Thailand in August, we are now all set to visit Singapore on the 6th of September 2012 (Thursday). The event is scheduled to start from 9:00 AM to 12:30 PM at the Marina Bay Sands Convention center, 10 Bayfront Avenue, Singapore 018956. Looking forward to meeting with you in Singapore, do not forget to register for the event please.